When we desire to ‘Know thy Self’, we first must understand our ‘Factory Settings’, what makes us ‘tick’, what are the ‘programs running on our ‘Hard Drive’ in other words. 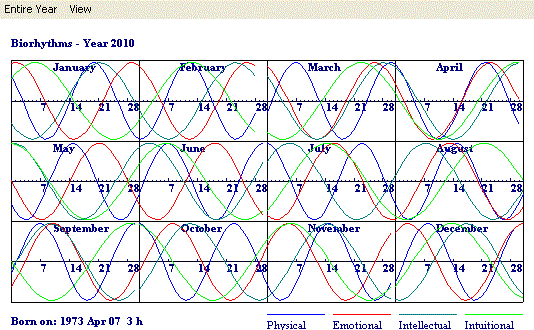 Biorhythms is where I like to start, so as you gain an understanding that some days are way better than other to take on certain tasks. A brief history on the discovery of Biorhythms – In the nineteenth century, studies first began on certain life rhythms or cycles that were later termed “biorhythms”. The word biorhythm is a compound of two Greek words, bios and rhythmos, which mean life and a constant or periodic beat. The theory of biorhythms defines and measures three basic and important life cycles in man: the physical, emotional, and intellectual. Wilhelm Fliess, a highly respected and prominent doctor in Berlin, did pioneer work on biorhythms in the 1890s. Fliess, who had observed 23- and 28-day rhythms in many of his patients, began to collect statistics on the periodic occurrence of fevers, childhood disease, and the susceptibility to disease and death. With these statistics in hand, Fliess believed he had detected rhythms which were fundamental to man’s life. Dr. Fliess later developed two major biorhythm theories: first, that Nature bestows on man “master internal clocks” which begin counting time at birth and continue throughout life; and second, that one of these clocks regulates a 9-3-day cycle influencing man’s physical condition and another regulates a 28-day cycle influencing emotions or degree of sensitivity.